Line 9-inch square pan with foil, extending foil over edges. Spray lightly with nonstick cooking spray. Melt chips in small saucepan over low heat, stirring until smooth. Remove from heat. In medium bowl, combine powdered sugar, cream cheese and frosting; blend well. 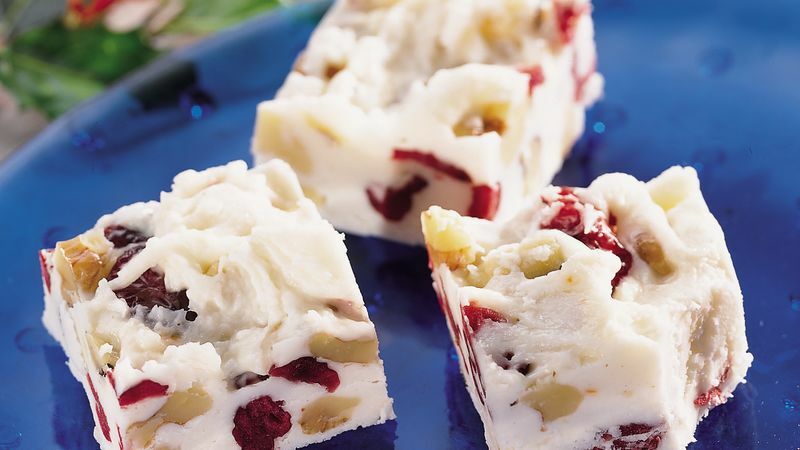 Stir in melted chips, walnuts, cranberries and orange peel. Spread in sprayed foil-lined pan. Refrigerate about 1 hour or until firm. Remove fudge from pan by lifting foil; remove foil from fudge. Cut into squares. Serve fudge at room temperature.